The programmed cell death-1 (PD-1)/programmed cell death-1 ligand (PD-L1) pathway has been shown to play a pivotal role in tumor evasion. Inhibition of PD-1 and its ligand PD-L1 using an immune checkpoint inhibitor has emerged as a promising immunotherapy for the treatment of various types of cancer. The expression of PD-L1 in tumor cells and tumor-infiltrating lymphocytes (TILs) has been shown to be correlated with improved efficacy of antibodies against PD-1 or PD-L1. Moreover, the density of CD8+ TILs has been shown to be correlated with the response to immunotherapy. In this study, we examined the expression of PD-L1, CD25, PD-1, FoxP3, CD4, CD8, and EpCAM in 42 peripheral blood samples and fresh tumor specimens using multiparametric flow cytometry. Our results showed that the percentages of PD-L1-expressing CD25+ CD4+ T cells were significantly higher in TILs than in peripheral blood lymphocytes (PBLs; TILs: mean, 48.6%; range, 23.6–81.5% versus PBLs: mean, 35.4%; range, 16.8–64.3%; P < 0.001). The density of CD25+ PD-L1+ CD4+ TILs positively correlated with that of PD-1+ CD8+ TILs but negatively correlated with interferon (IFN)-γ+ and tumor necrosis factor (TNF)-β+ CD8+ TILs. 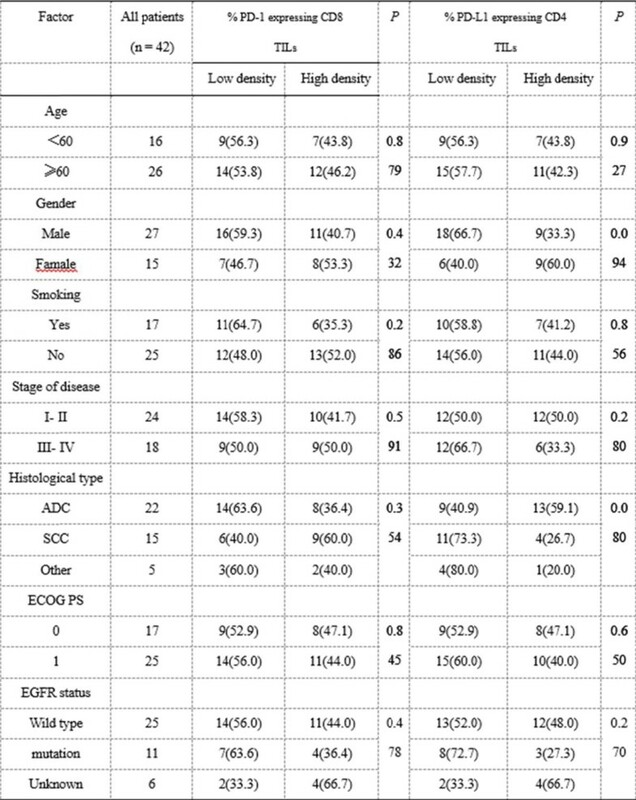 However, the high ratio of CD8+ TILs to that of CD25+ PD-L1+ CD4+ TILs or to EpCAM+ tumor cells were associated with high percentages of IFN-γ+ and TNF-β+ CD8+ TILs. Moreover, inhibition of PD-L1 and PD-1 decreased the density of CD25+ PD-L1+ CD4+ cells and PD-1+ CD8+ TILs but increased the percentage of IFN-γ+ and TNF-β+ CD8+ cells. High ratios of CD8+ TILs to CD25+ PD-L1+ CD4+ TILs or to EpCAM+ tumor cells enhanced the activity of tumor-specific CD8+ T cells after PD-1/PD-L1 blockade therapy. Taken together, our results highlighted the importance of CD25+ PD-L1+ CD4+ TILs in mediating the tumor microenvironment immune response. Our findings also indicated that high ratios of CD8+ TILs to CD25+ PD-L1+ CD4+ TILs or to EpCAM+ tumor cells in patients may be more effective after PD-1/PD-L1 blockade therapy. 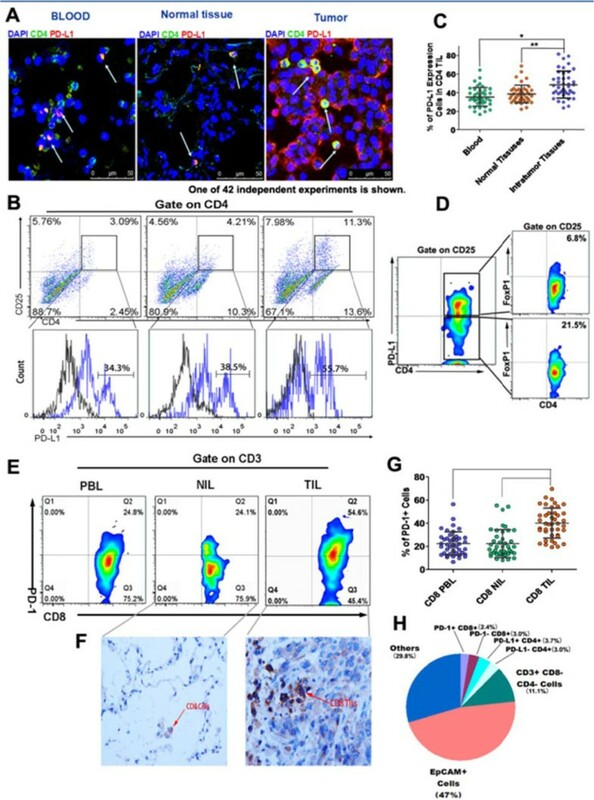 Thus, the variable density of CD8+ and CD25+ PD-L1+ CD4+ T cells within the tumor microenvironment caused differential responses to PD-1/PD-L1 blockade. Correlation between the clinicopathologic characteristics and PD-1+CD8 TIL or PD-L1+CD4 TIL in 42 lung cancer patients.